Cancer is rarely a consequence of an abnormality of a single gene, but reflects the perturbation of the complex intracellular molecular network. By integrating multiple types of high throughput omics data, network-based modeling focuses on the mathematical modeling of the complex genetic pathways underpinning the hallmarks of cancer. Tumorigenesis and therapeutic responses involve dynamic changes in the molecular network of cancer cells. Identifying and understanding the dynamic rewiring of gene network is critical for understanding cancer pathogenesis and development of therapeutic interventions. 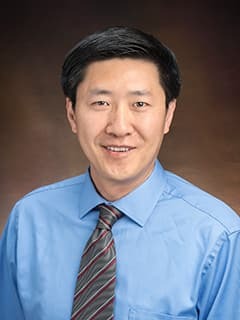 Researchers at the Center for Childhood Cancer Research, led by Kai Tan, PhD, are developing computational methods for comparing multiple gene networks from patients with different disease subtypes or have different responses to therapeutic interventions. The identified network rewiring events have been shown to improve the accuracy of disease prognosis and offer new insights into gene pathways underlying disease progression. The network-based view of tumorigenesis implies that most diseases are difficult to treat through the use of a single drug. Drug resistance and toxicity are two major challenges in cancer therapy. Increasing attention is being given to therapies that involve multiple drugs, the so-called combinatorial drug therapy. Researchers in the Tan laboratory are developing computational methods to systematically identify multiple drug targets that have an optimal impact on the disease phenotype and minimal side effect.